In this day and age of gaming, you would expect that almost every game would have some form of voice acting, even if it’s just a few generic lines that have nothing to do with the text on screen. The games that have none of this are typically the ones with very simplistic art styles where you can’t even really see the characters faces clearly. Stuff like the JRPG’s of old. Dragon Quest XI is not this. 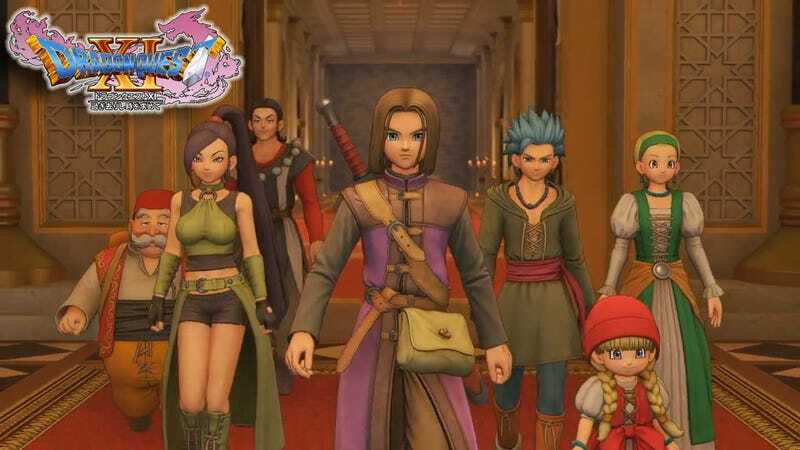 As seen in the image above, Dragon Quest XI has beautifully rendered 3D characters created by acclaimed mangaka Akira Toriyama of Dragon Ball fame. It looks like the far more anime-inspired sibling of Final Fantasy, albeit more open-ended. And just looking at that picture, I expect the characters to start speaking any second... but they won’t. The lips of the characters lips move, their faces show various expressions, but no sound leaves their mouths. There’s just text on the bottom of the screen. I’ll admit that I’ve never played a Dragon Quest game before, but even so, if you’re going to go this far with the graphical fidelity of a game, it can be jarring for there NOT to be voice acting. Therein lies my problem, but at the same time Square Enix has a very sound reason for their decision. By not having voice acting whatsoever, they were able to continuously tweak the story and script right up until the very end of development, maintaining full control over it. On the other hand, if they had gone with voice acting like in previous Dragon Quest titles, then they would have had to lock down the script earlier in development, and any changes they felt needed to be made would be more difficult to do. And while it wasn’t mentioned in the article, voice acting does impose further constraints: limitations on amount of dialogue. This can best be seen in a game like Fallout 4. Previous Bethesda games did not feature a voiced protagonist, allowing the player to have mostly full control over what they could say and have dozens of dialogue options to choose from. However, when voice acting was added to Fallout 4, the permanent limit to dialogue options became four. Why? Because more lines of voiced dialogue means more money and more time spent in the booth. And that exponentionally increases when all of the other characters in the game have to be able to react to all of the players dialogue choices with non-stock phrases. By leaving out voice acting from the final game, Square Enix has effectively allowed themselves to craft the best story they possibly could(Which, at this moment, I have not read any translated reviews or import reviews of the game, and thus can not be sure of its quality.) in the time they gave themselves. Of course, this does not mean that voice acting in the future is off the table. Dragon Quest VIII was released in the west with English voiceover even though the original Japanese version had none. It wasn’t until the 3DS remake that Japan got voiceover. And with Dragon Quest XI coming to the US in 2018, it’s possible that since the script has been finalized, voice acting can be recorded for that version. And in a potentially surprising move, Square Enix could also record Japanese voiceover and add it to the Japanese version of Dragon Quest XI via an update or as optional DLC. Square’s reasoning behind their decision is a sound one, though it is still an oddity in the modern gaming industry. Only time will tell if the game forever remains unvoiced in all territories, voiced only in some, or voiced in all in the future.